I don't know about anyone else, but going to Starbucks is one of my favorite things about this time of year. I'm sure that probably sounds silly, but just I love the decorations, the festive treats, and of course the coffee—it's all so great for me. I especially like that Starbucks picks a theme for their decor every holiday season and uses it all around their stores. I'm not even going to touch the cup controversy that happened this year, but the holiday chalk art that's on lots of the signs, pastry bags, and even the window art was particularly inspiring to me in its simplicity, so when it came time to do my first holiday nail design of the season, that's the look I decided to recreate. 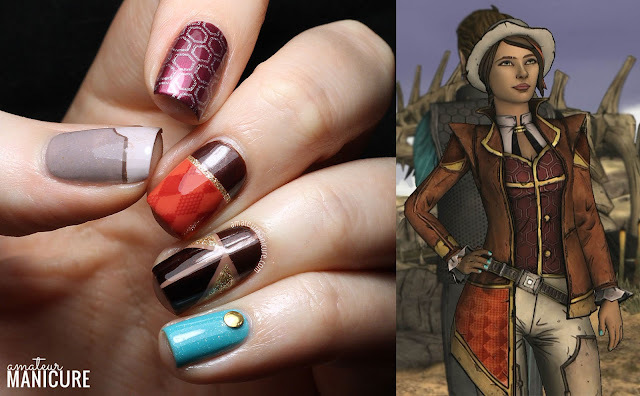 When I posted my first Tales from the Borderlands manicure a couple of months ago, I heard from a few folks that I should also do some nails for the game's other main character, Fiona. Well, I love Fiona a ton, and the only reason I shied away from doing a design for her the first time around was because I knew how much harder it would be, so... I really have no good reason for not doing it the first time around, is what I'm saying here. It took me a little while to pull together my ideas—and supplies—to execute this look how I'd envisioned, but it turns out my timing is actually pretty good: the fifth and final episode of Tales from the Borderlands was released just a couple of weeks ago, making now a great time to get excited about the game and go check it out. I talked up TftB a bunch in my last post, so I won't repeat myself, but guys, seriously. Go play it. You won't regret it. Anyway! On to the nails! Happy (early) Halloween, everyone! Halloween is one of my favorite holidays, so even though I've been super busy with work and vacation and then getting sick at the end of it all, I couldn't let the occasion pass without posting some seasonally appropriate nails here. I'm afraid you're all going to have to humor me here, because this is probably another one of those manicures that most people are just going to find totally strange. My apologies if that's the case! One of my big obsessions right now is the video game Tales from the Borderlands. It's a short little narrative adventure game by Telltale Games (they do lots of great stuff if you like stories more than shooting—check them out!) that I played a couple of weeks ago and completely fell in love with. It's gorgeous, funny, and full of complex characters that you can't help but adore. Right after I played the four (out of five) chapters that have been released so far, it was time for me to head to PAX Prime, a huge video game convention in Seattle. 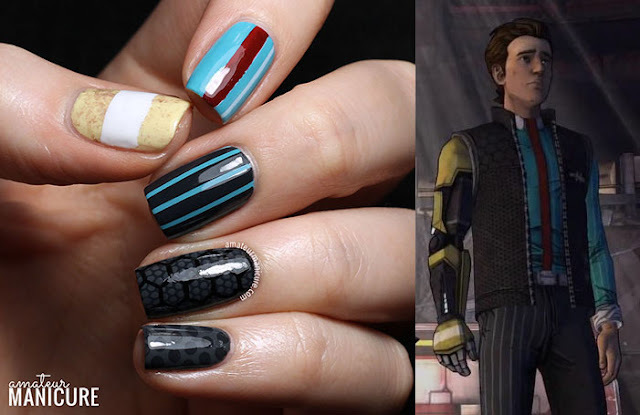 This seemed like the perfect opportunity to honor my current favorite game on my nails, so I decided to recreate the outfit of one of the main characters, Rhys, with nail polish. 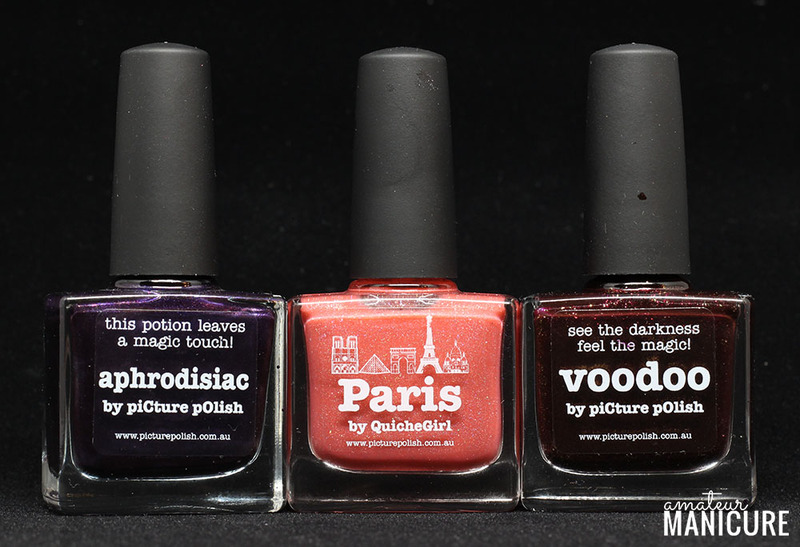 Today is a special day: it's My Picture Polish day! All the excitement about Pluto recently inspired me to try something space-related on my nails. Galaxy designs are fun and I've done a couple of them, but I wanted to do something new this time. 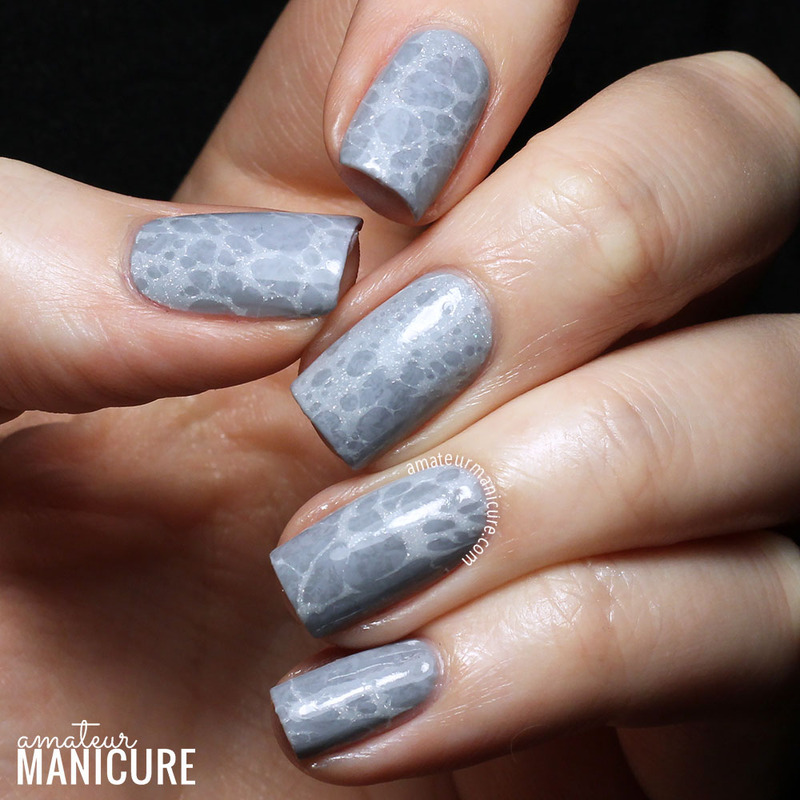 After some brainstorming (and perusing lots of NASA's new high-res pictures of Pluto), I decided: what about trying to recreate the surface of a planet on my nails? I don't really have any excuses about how long it's been since I've posted here. I'm not quite sure what happened! I've been distracted with other things for the last month, but I have still been doing nail art when I can; for some reason, sitting down to actually focus and write a blog post is the part of the process that's been eluding me. Can I blame it on the sunshine and my backlog of novels that I've been devouring? Anyway! On to the nail art. 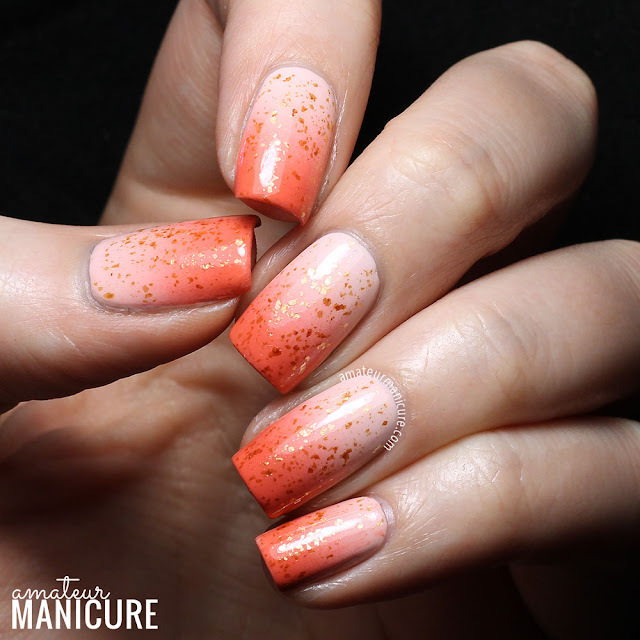 Today I have some simple but very summery gradient nails to share. 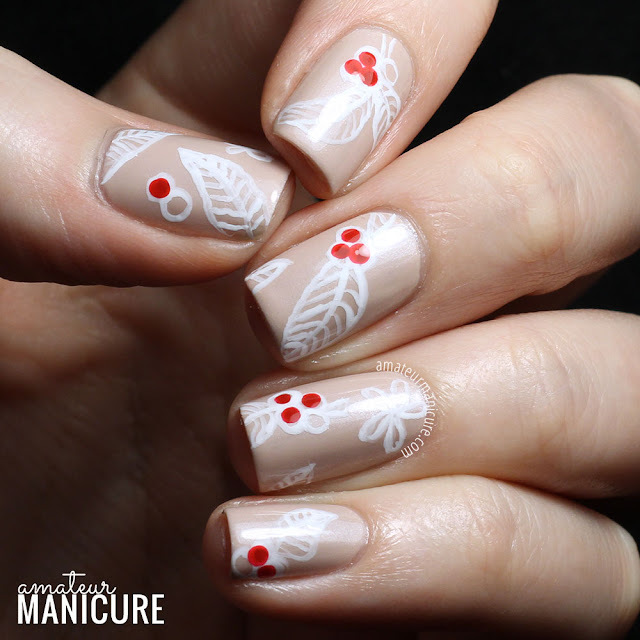 I ended up with this look recently when an initial nail art plan didn't pan out and I needed to come up with a plan B to cover the mistakes I'd already made. I never would have thought I'd end up liking a peachy-orange & gold design so much, since I usually don't like orange or gold, but I really fell in love with this as I wore it.